Handcrafted side protector made with high quality materials. A triple layer of fibreglass design with an anti-splintering system, essential ergonomic design fully adjustable with double ring fastener and high performance velcro straps. Handcrafted side protector made with CARBON FIBER COMPOUND SHELL. New ergonomic design fully adjustable with double ring fastener and high performance velcro straps. Handcrafted side protector made with CARBON KEVLAR FIBER COMPOUND SHELL. New ergonomic design fully adjustable with double ring fastener and high performance velcro straps. Skilled to protect low back area, femoral area and iliac crest. Kart Pants help to absorb the shocks creating a buffer on the areas most exposed to the stresses of the seat. Inspiration, motivation, knowledge and advice shared. 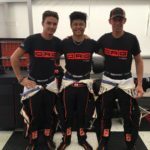 and we are still there helping karting drivers to get the best performance by improving their safety..
Everything started more than 15 years ago when Alessandro Begnozzi, a promising Kart driver, suffered a serious chest injury in an ordinary race accident which almost forced him to quit racing. After realizing the inadequacy of ordinary ribprotectors, his father Stefano decided to project a new product combining an ergonomic design and higher safety standards. He spent more than one year to develop the ultimate jacket involving the five times world champion Danilo Rossi and the whole DR Racing Team for continuous tests and improvements. 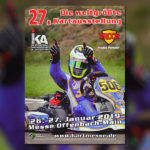 27th International Exhibition-Kart 2019 – Kartmesse. Offenbach. Kart pants on the podium at Genk (match valid for the European Championship class KZ) with Simu Puhakka. Bengio HST thanks Flavio Camponeschi, CRG official driver, for collaboration in new product development.